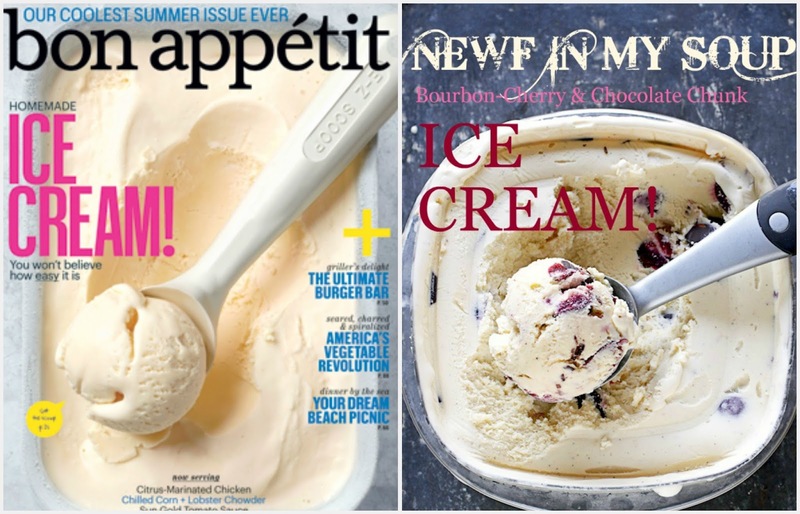 I was thrilled to see ice cream on the cover of the August Bon Appetit because 1) my KitchenAid Ice Cream Maker bowl has been patiently sitting in the back of my freezer all summer, and 2) I've been making gift jars filled with Strawberry Meringues for a client the last few weeks and have accumulated a nice collection of egg yolks in the freezer next to it. The cover recipe is for True Vanilla Ice Cream, which is great served alone or slowly melting over a warm slice of cherry pie or plum tart, but it also serves as a base for add-ins like bourbon cherries and chunks of dark chocolate. Bon Appetit provides flavor upgrade recipes for Cherry-Bourbon Ice Cream and Chocolate-Malt Ice Cream. I'll be making another batch of meringues this week and will be forced to try the Chocolate Malt Ice Cream next...oh darn! 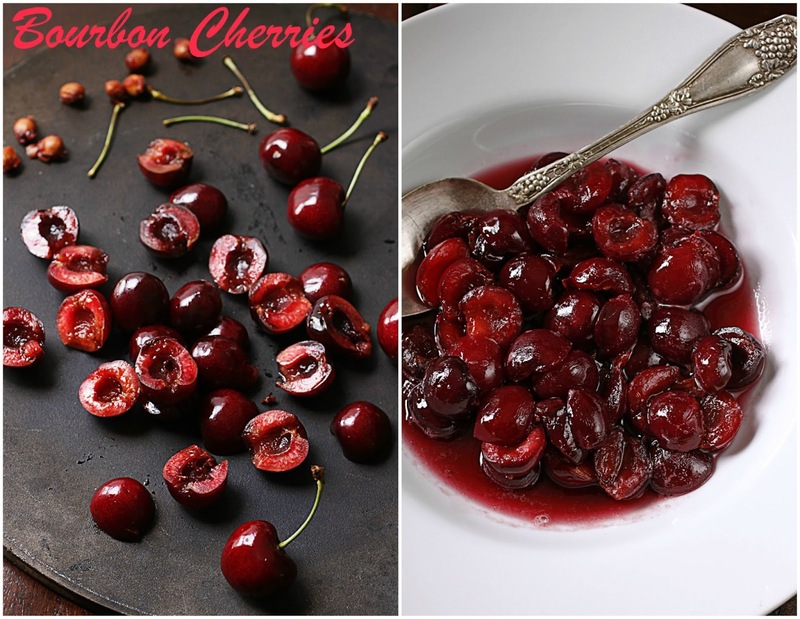 Cherries have always been a love of mine. As a child, I couldn't resist cherry pie, frosted cherry pop-tarts, cherry cheesecake, and cherry ice cream. Must be because I'm a June baby, when cherries are at their peak. Regardless, my love for them continues in those same childhood favorites, as well as a few others like seared duck breast with cherries and port sauce, cherry clafoutis, dried cherry and almond scones, and Ben & Jerry's Cherry Garcia ice cream. I made the True Vanilla base and then added in Bourbon Cherries and chunks of dark chocolate (from a 4-ounce bar of bittersweet chocolate). My only regret is not making a double batch. You can find the recipe here. I don't need to tell you how easy it is to open the freezer, pull out the container and sneak a few bites. But it's impossible to stop there with this ice cream. You'll be compelled to take the container to the couch and polish off at least half in one sitting. I'm now adding bittersweet chocolate and malted milk balls to my grocery list today and you should do the same. 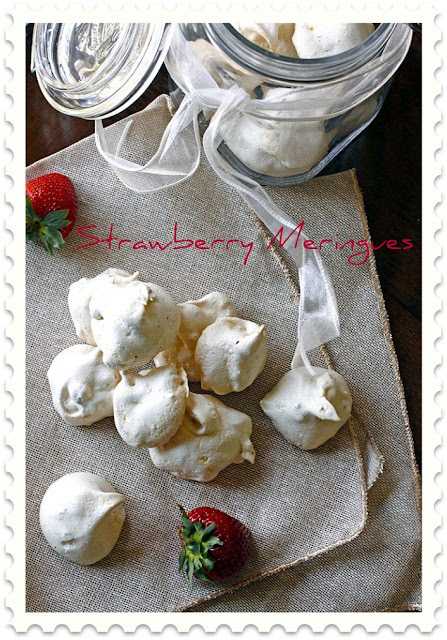 Oh, and for your leftover egg whites, here are the Strawberry Meringue Clouds that have been flying out the door...thanks, Giada! Meringues and ice cream - you're killing me. 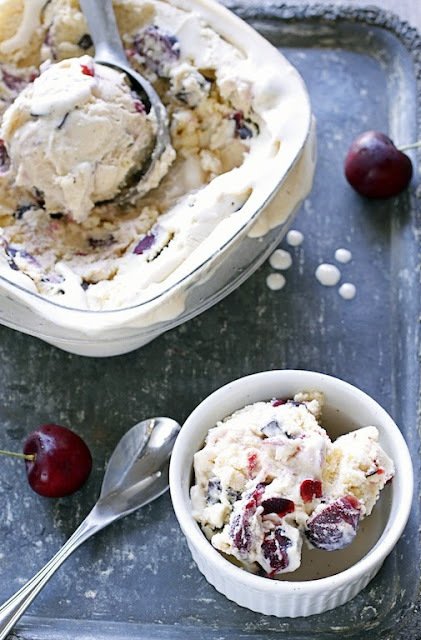 I'm like you, I love anything with cherries, especially cherry ice cream! What a great way to use them while they're still in season!